A parliamentary report into the Shirley McKie case has heavily criticised the management of the Scottish Fingerprint Service (SFS). MSPs were also critical of the justice minister over Ms McKie's compensation deal and cleared fingerprint officers involved of acting maliciously. The report concluded that significant weaknesses still need to be addressed. The former detective received a £750,000 out-of-court settlement after being cleared of committing perjury. Ms McKie, from Troon, Ayrshire, had been accused of leaving a fingerprint at the Kilmarnock home of murder victim Marion Ross 10 years ago. She contested the opinion of experts from the fingerprint service. 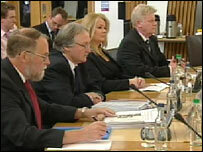 The 11-month Holyrood inquiry was the longest and most complex mounted by MSPs to date. The members of the Justice 1 Committee said: "Management must take action to address fundamental weaknesses which have seriously impaired the efficiency and effectiveness of the SFS." The MSPs highlighted the failure to have one standard approach to identifying fingerprints as "unacceptable". They also flagged up concerns about quality assurance, the high levels of sickness in the Glasgow fingerprint bureau and frequent changes of personnel higher up the organisation. However, it said the service faces considerable challenges if it is to become a "centre of excellence". 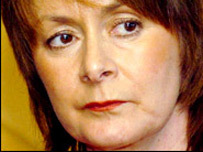 Ms McKie's father Iain said the report had not moved things forward and a judicial inquiry was needed. He said: "There's so many issues at stake here. Who murdered Marion Ross? Was there any criminality between the police and the forensic experts? "It's taken a year to do it, it's cost hundreds of thousands of pounds and hasn't taken us any further on." Members of the SNP, who have supported Ms McKie's case, called for the justice minister to resign, saying the report made her position "untenable". However, Ms Jamieson said she welcomed the report. "We will now need to give careful and detailed consideration to the committee's conclusions and recommendations," she said. "In doing so, I want to re-state my clear commitment to ensuring that the SFS provides a world class service fit for the criminal justice challenges of the 21st Century." SNP justice spokesman Kenny MacAskill said the report left some crucial questions unanswered and called for a full public inquiry. He said: "Despite the fact that concerns about the operation of Scotland's fingerprint service have been under debate for 10 years, a properly functioning bureau remains at least two years away. "Many senior figures, including justice ministers Jim Wallace and Cathy Jamieson are implicated in the failure to properly resolve this crisis in Scotland's criminal justice system."